Are Physicists Ready To Give Up The Chase For SUSY? Is physics in crisis? An article in the May issue of Scientific American by physicists Joseph Lykken, from Fermi National Accelerator Laboratory, and Maria Spiropulu, from the California Institute of Technology, lay bare an issue that is keeping a growing number of physicists up at night. Will supersymmetry — the hypothetical symmetry of nature proposed some 40 years ago — be proved out? Or should it be archived to history as just another clever idea that didn't prove true? A lot is at stake: the lifework of many eminent physicists, both theoretical and experimental; our understanding of how matter behaves at high energies; a possible solution to the dark matter problem, the mysterious particles that cloak ours and other galaxies in the universe; a deeply ingrown faith that nature has an underlying simple structure, somehow coded in an overarching "super"-symmetry; the realist philosophical position that the universe is, in its essence, comprehensible by reason. There are many questions that we would like to have answers to, questions that cannot be addressed by our current description of particle physics, the wonderfully successful Standard Model. The Standard Model encapsulates all we know so far of the material world: that there are 12 matter particles (the electron being the most familiar) and 12 kinds of particles that transmit the forces between these matter particles (the photon being the most familiar). To these, we must add the most recent particle celebrity, the Higgs boson, found in 2012, and the hypothetical graviton, the particle that supposedly transmits the gravitational force. However, we don't know why the 12 matter particles are arranged in three families of four members each. Why not six families? Or 23? Physicists like to understand numbers, as opposed to taking them for granted. Also, we don't understand the vast differences in the masses of these particles; for example, the electron is about 252,000 times lighter than the Higgs. Is this just a coincidence? Or is there a deeper mechanism that can explain it? The other class of problems has to do with the interactions between the particles. The way we picture it, particles interact by exchanging other particles, like two ice skaters throwing tennis balls at one another. However, according to quantum mechanics, all kinds of particles could take part in this exchange, including very heavy ones. This would quickly turn interactions into major warfare, causing effects that are not seen in experiments. So, either these super-heavy particles don't exist, or there is a mechanism to suppress their presence. In its simpler version, (called "natural" supersymmetry) the theory does a great job of answering many of the questions the Standard Model leaves open. The problem is that in order to be a true symmetry of nature, effects from supersymmetric theories must be seen. In particular, one of its most dramatic predictions is that the number of particles must be doubled: every particle must have a supersymmetric cousin. Of these, most, or even all but one, are unstable and decay very quickly. But the lightest of them should be stable and should be around, with a mass not very different from that of the Higgs. In this case, machines like the Large Hadron Collider (LHC) at CERN in Switzerland should find it. 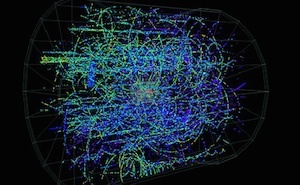 So far, not a trace of supersymmetry has graced the amazing detectors at CERN. Or the dozens of other experiments spread around the globe hunting for supersymmetric particles raining down from the heavens, something that should happen if they are, indeed, dark matter. Things are not looking good for SUSY. The LHC has a new run planned for 2015 with substantially higher energy. As the energy of the collisions increase, heavier particles can be "made," out of the conversion of motion energy into matter, as described by the E=mc2 formula. If no supersymmetric particle is found then, physicists will have to make a very difficult decision, not unlike letting go of something you have loved deeply and committed to for a long time but that now is causing more harm than good. Of course it may be that supersymmetry is a symmetry of nature, but realized at energies well beyond the reach of our current machines. This is what Arkani-Hamed was saying. But if this is the case, we need to change the story quite a lot and redefine what it is that we want supersymmetry to answer. Clearly, it won't do much to help as understand the Standard Model. Theories need to be consistent. But they also need to be falsifiable: this is where theorists do need to be consistent. If you can't test a scientific hypothesis, what are you doing, exactly? Supersymmetry, beautiful as it is, has the annoying feature that it can always be hidden from testing, a slippery fish you can't hold on to. Of course, the ultimate judge of all this is nature itself. But a theory that is always hiding from us serves very little purpose as an explanatory scientific device.